Honestly, I was really happy about this. I'm not brave like a Gryffindor; I'm smart but not clever like a Ravenclaw. I love the words used above to describe Hufflepuffs - I do think they ring true for me! Newt Scamander, Nymphadora Tonks, and Cedric Diggory were all Hufflepuffs. Friendly, decent, protective - all can describe Hufflepuffs! Next, I discovered my Patronus... a White Mare! I wish Pottermore had descriptions of the different Patronuses, but oh well! It still seems like a pretty cool one! From what I read on Pottermore, my wand is a bit unique - acacia wood is unusual for wands. It can be temperamental but also very powerful. The phoenix feather core is also rare and is "capable of the greatest range of magic." They are picky in finding owners and hard to master. What House do you belong to? What is your Patronus? What unique qualities does your wand have? Ooh, interesting that you're all Slytherin except for one! Fun post! I did the sorting not too long after the site opened and I was sorted into Hufflepuff too. I'm always torn though because every other quiz I've taken over the years puts me in Gryffindor. I guess I consider myself a hybrid of both, lol. Haha, I can see how a person might fit into two houses! Fun post! I got sorted a long time ago. I’m a Ravenclaw. My patronus is a marsh harrier (I think? It’s a bird). I don’t remember anything about my wand, but I know I had one. I can totally see you as a Ravenclaw! And a bird, that's a cool Patronus! I love this, Angela! I did the Pottermore thing years ago and couldn't remember my Patronus or my wand. I did remember that I was a Ravenclaw (I was OK with that). So, I went and looked up my Patronus - it's a 'Ragdoll Cat' (and I'll have to go read more about that) and my wand is 'Laurel wood with a Phoenix feather core 10 ¾" and Slightly Yielding flexibility' (will also have to read more about that). That's cool that we both have phoenix feather cores! Love this! Pottermore is so much fun. I am a Gryffindor and my Patronus is a hedgehog. I love that it is a hedgehog. Oh this is great! A white mare sounds really cool. I was sorted in Slytherin and my patronus was a black mamba (? that was a surprise!) I love the look of your wand! All I remember off the top of my head is that mine was laurel wood with a dragon heartring core. Ooh, dragon heartstring! That's so cool! And a mamba?? Wow! I am not a potter fan, but I am glad you were happy with your sort. I'll probably have my reading credentials revoked, but I've not read a single Harry Potter book! I feel like it's all a big foreign language. I felt that way for a long time, and then I finally read the books and fell in love! Definitely think Huffepuffs are underrated. More people need to value how friendly they are. I'm personally a Ravenclaw, but it's important to value all the houses. Ooh, a white mare, how lovely. My Patronus is a Newfoundland god which is perfect because I love big dogs. Can't recall my wand though. Oh, that's a cool Patronus! I definitely agree, all the Houses have admirable qualities. I'm a Hufflepuff too. I don't think I was thrilled about it at first, but as the world has gotten meaner and tougher, I've started to appreciate and lean into my Hufflepuff tendencies more and now I'm pretty proud. I totally agree! They have so many wonderful qualities, and like Alicia said above, Hufflepuffs are a bit underrated. OMG I love your patronus! mine's a Black swan (how one can distinguish the colour of the swan in a corporeal patronus i honestly don't know lol) but I love mine!! *heart eyes* I wish I'd gotten a magical animal though! Those are apparently very rare! And i'm a Gryffindor! Ooh, I love your Patronus, too! So elegant! Love this, Angela. Everyone told me they thought I’d be a Hufflepuff but I turned out a Ravenclaw...BUT I’ve not read any of the books. I’ll do it again once I read one, which I hope won’t be too long! Interesting! Those houses are pretty different. I hope you enjoy the books! It's great when the sorting quiz actually gets you right and the description of your house really rings true for you! That was me with Ravenclaw. Your patronus is so much cooler than mine though lol. I think I got a beagle or something like that. Haha, well, a beagle is cute!! Aww, it's ok, it's not for everyone! 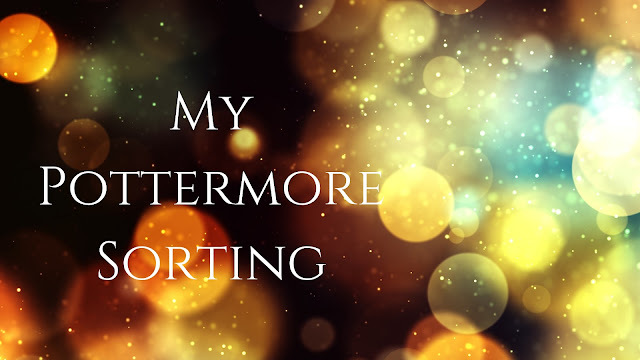 I LOVE pottermore, its such a fun way to spend an afternoon or three. I always said I was a Ravenclaw, and pottermore confirmed it :) MY patronus, however, is a falcon? Not what I would think, but okay. I didn't even realize I could figure out what my wand is!! That's awesome that you knew what house you belonged in! A falcon is pretty cool!